Syria on Wednesday returned to Iraq around 700 pieces of antiquities, including gold coins and jewellery, which were stolen in the aftermath of the US-led invasion of its neighbour. 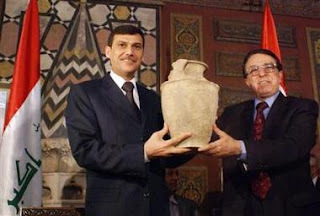 Culture Minister Riad Naassan-Agha handed over the artefacts to the minister of state for tourism and archaeology, Mohammed Abbas al-Oraibi, at a ceremony at Damascus national museum. "These objects stolen in Iraq were seized by Syrian customs officials," Naassan-Agha said, according to the official SANA news agency, adding that other "very precious" artefacts will be returned soon.